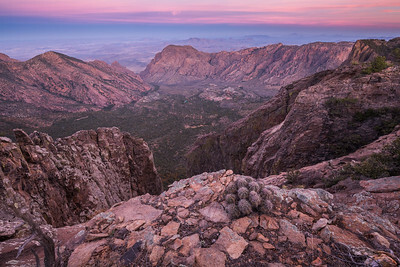 Big Bend National Park, Texas / Part of what makes the Chisos Mountains in Big Bend so remarkable is that they maintain a literal fossil ecosystem, the last remnant left of a glacial forest that stretched across the whole region during the last stretch of ice age, over 10,000 years ago. A unique subspecies of whitetail deer inhabits the mountains, unable to survive in the surrounding desert, while bears, mountain lions, and javelinas are also present. The mountains are an essential habitat for Peregrine falcons, as well as a whole host of other birds. In short, the Chisos are a veritable Lost World. Standing there, high up on the South Rim cliffs, gazing at the last of the sun's glow over the mountain-ripples of the waterless Chihuahuan sea, and thinking of all of the life held afloat by these igneous cloud-islands, I felt it. I was struck by the mountains' purposeless benevolence, a gift from no one to anyone, and I felt truly thankful for the universal coin-toss that determined whether there would be nothing or everything. 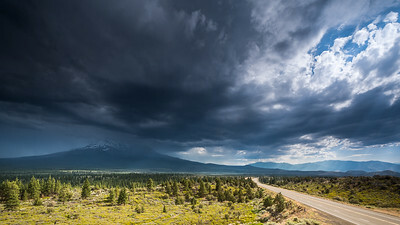 Mount Shasta, California // In popular culture, dark clouds on the horizon is a universally ominous symbol, a stock metaphor to foreshadow that trouble is coming. But for Californians right now, and really for anyone who loves a good storm, there are probably aren't many sights more exciting than dark clouds on the horizon. Took 3 passes to get here: Grand green valley, flat and made flatter still by the granite pyramids of the northern Rockies. Camp found near Pettit Lake, coaxed fire out of wet logs, a shelter in the small pines. One more journey for the day: step 'cross sage flats, dirt soft with fresh rain, flora adorned in green and gold. 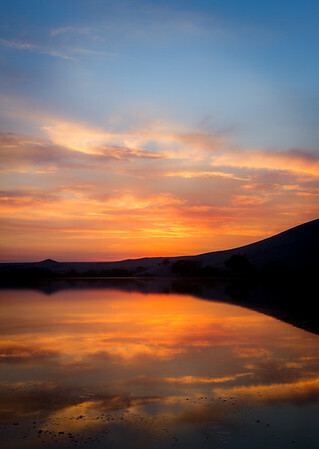 Clamber up hill, muddy feet sliding in sandals, til view is clear: the two matriarchs of this drainage, resting, like dear rivals, on each side of the lake. 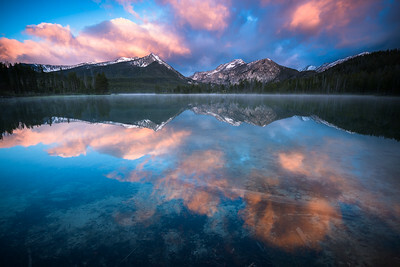 Yes, this is a motherly landscape! Nurturing arcadia, sheltered by rocky peaks & forest hills. Waters shallow and quenching, calm even in this weather. I think of Ocean, the airless dark, opacity of depth. The source of all life, yes—but in a far-off, murky way, like a father only known in infancy. But here, with this wet earth between my toes, I know right where my weight is resting. Deer watch on my reverence, cautious but not scared. Mind flushed and clear. 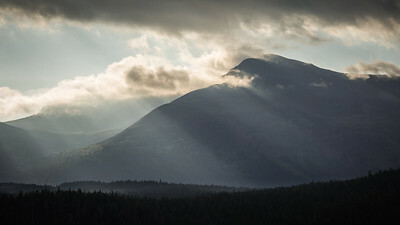 snow-driven peak blown into cloud-- June's stormy kiss. 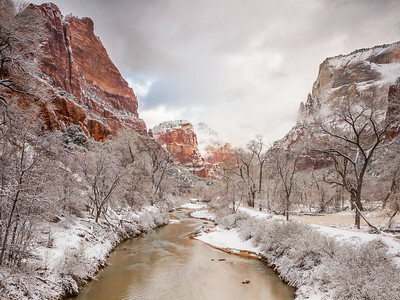 If you visit Zion National park, it becomes immediately obvious why it's named "Zion." For my money, it's probably one of the closest things on earth to a true holy land. 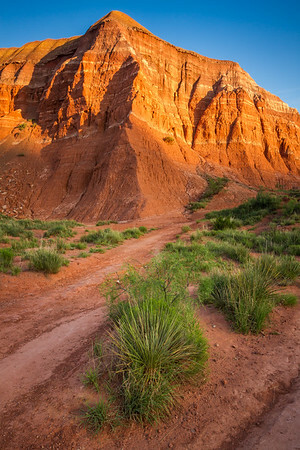 The towering and sculptural cliffs have a mysterious, spiritual quality about them, and if you're in the right state of mind it can bring out a sense of child-like wonder, a spiritual awe, and a disbelief that we are lucky enough to have such a place exist in this universe. Palo Duro Canyon State Park, Texas // Shadows, in a sense, are just the remnants the night, carved out of the grand darkness by the warm rays of sunrise and shrunk ever further by the rising noontime sun. But shadows, patient creatures, are like rivers running to the sea: as sure as the sun will set they will always return to the dark everything from which they were born. Yosemite National Park, California // Of course, no mountain photographer's trip through California would be complete without a stopover in Yosemite. Of course, the park must be one of the most-photographed locations on the face of the planet, but when you're faced with so much concentrated beauty it's a little harder to think about the legions of light-chasers who've visited the park for over a century. I guess what I mean to say is, if it is the most-photographed place on the planet, I can see why. 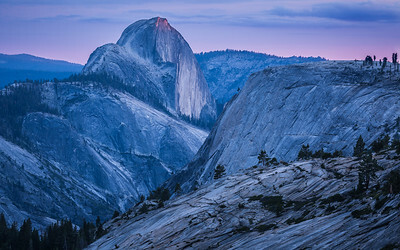 Here's the iconic Yosemite formation--Half Dome--receiving the setting suns's last kiss of ruby light, while the rest of the wilderness bathes in twilight. 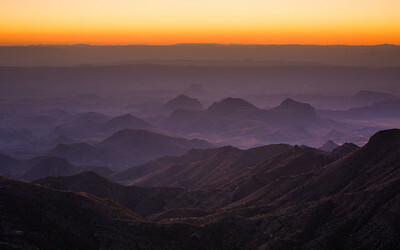 Big Bend National Park, Texas / From my notebook, resting on this 2000-foot cliff in the early morning light: Boundless nighttime unity stretches in all directions, to Mexico and on, a whole hemisphere of darkness. Stars twinkle meekly through hazy desert cloud.A moment, and the fullness of night emerges from the false headlamp darkness, detail-rich even with this sliver moon. Not long, and the winter sun rises from Mexican peaks. Shadows stretch and shrink, deep hard-edged pools of night, hiding in valley and forest, waiting for the planetary turning to return their mother, shadow-full Mother Night, from the other side. 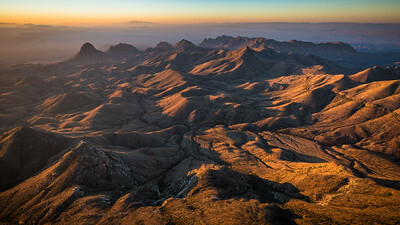 The high-walled Chisos Basin is the cradle of the park, of the impossible, desert-defying variety of life that lives there, of the morning shadows and evening shadows, of the heart of anyone who visits there, and to the mind of that visitor, of all things. Austin, Texas // Patterns in plants are downright fascinating. That a certain type of spiral growth can be effective across so many species, to reappear again and again and again, as much as we can measure it, is probably one of the cooler things about reality. A lot of people read into this as evidence of some spiritual force or designer, but I don't really see it that way. This may be controversial, but I think that things are the way they are because they work. 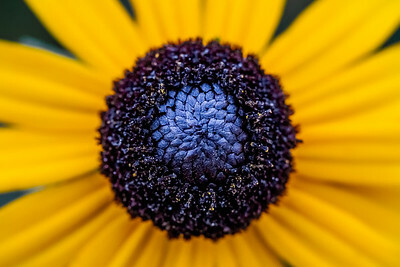 The golden ratio is everywhere because it just happens to be the most efficient way to grow. Without it, there would be another pattern or just no plants at all. Order doesn't exist for a particular reason, but it is necessary for our wondering about it because it is a prerequisite for our existence. Patterns like this are a reminder to me how lucky we are to have happened to exist and get to enjoy and love and wonder about things like patterns. 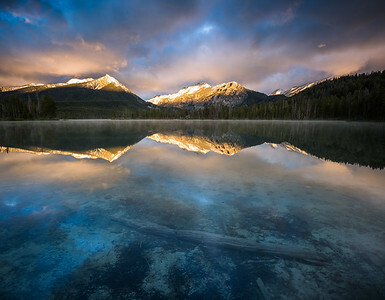 The two Matriarchs of Pettit Lake illuminated by the golden rays of cloud-piercing dawn. On such a morning in the Sawtooths, you'd best be careful or the mountains will cut right through you ego. Pennybacker Bridge, Austin, TX // Something I have been practicing lately is letting the elements of the photo dictate the composition. For instance, here the extent of the branches decides the top and left boundary of the photo, and the point that the road moves out of sight determines the right boundary. 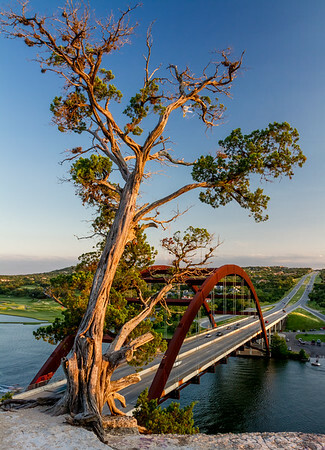 In looking at other photos of the iconic Pennybacker Bridge that a lot of photos don't end up using this kind of composition , and awkwardly crop off the tree or prevent you from seeing where the road is headed. This is obviously subjective, but these are the kinds of things I like to watch out for. That just leaves the bottom as a judgment call, and with something as same as limestone, I just like to leave a little hint or border that it's there. After all, here it's more context than anything. I think this helps create a more organic-feeling composition, with fewer awkward or uninteresting spaces. 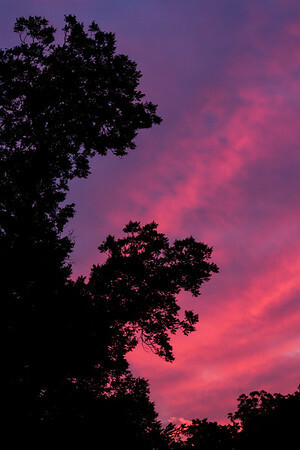 Austin, Texas Here's a classic Texas summer sunset, setting the humid sky alight behind the darkening pecan trees. It's always a welcome sight here, because it means that the temperature will soon fall from sweltering to just uncomfortable. As a bonus factoid, a lesser-known nickname for Austin is the City of the Violet Crown, and while that name usually refers to the often-visible Belt of Venus, it seems equally appropriate for the wild sunsets we get here. Big Bend National Park, Texas // From the spontaneous thought notebook: Our universe itself is based on the unified dichotomy! Space & matter interplay to allow anything to exist. One can imagine the pre-Big Bang Universe as a perfect dichotomy: all matter in one place, all space separate. A simple, lifeless universe. But that didn't last, and so we have our messy life-giving wabi-sabi ordered-chaos universe instead! To favor the fullness over the emptiness, or vice versa, is a simple arbitrary value statement. Everything is totally empty, everything is totally full! Both/and, not either/or! Yosemite National Park, California // I wonder why it is that major life events always seem to happen all at the same time. Always a dogpile of responsibilities and hassles, always with you at the bottom. Maybe it's some kind of mystical rite of passage, a heavy-handed symbol from the universe, bluntly saying that yes, it's time to move on into a new phase of your life. Maybe it's a desperate attempt by the writers to swell up viewership on their pan-dimensional cable network. Maybe it's a just flashbulb memory, an artifact of our minds, and we simply remember the pileups more easily than the leisurely times when stressful situations unfolded in an orderly single-file line. The one thing I know for sure is that when you're getting stuck in a dramatic time, there's no therapy like a getting lost in a dramatic landscape.